Finding great talent these days can be difficult, especially for small businesses. Once you find the perfect match for your team, it is important to have strong employee retention strategies in place so you don’t lose them. If you have read some of our past blogs, you have the onboarding process down-pat, employee engagement techniques lined up, and have gathered a few tips on staff retention. Complete your “success package” with these 4 employee retention strategies you need to implement. It is hard to find something when you are unsure of what to look for. Determine the ideal employee you are in search of first, then begin interviewing applicants. Also, don’t forget about your current employees; they can oftentimes be one of the best resources when looking for new talent. Plus, involving current employees can boost employee retention because your staff can feel that their opinions are valued. A big part of employee retention strategies is realizing that employee engagement can be a bit of a scatter plot. We’ve all been privy to co-workers or employees that come in and do the bare minimum just to collect a consistent paycheck. These are the types of employees you want to avoid! ‍♀️ When interviewing applicants, ask them about their interests, why they feel the position is right for them, etc. This will help you determine how motivated your new hire will be to excel in their position. Staff retention relies on you realizing that while you might be fine burning the candle at both ends, you can’t expect that of your employees. When it comes to running and/or working for a small business, I’m sure you will agree that it is fairly easy to overwork yourself, especially with a team of 10 employees or less. Although you have to stretch capabilities as far as possible to complete tasks, you do not want your staff experiencing constant burnout (a mental state of mind that causes you to lose motivation and focus which can lead to extreme amounts of stress). Operating in this type of work environment puts a strain on employee retention, and leads to high turnover rates –– and as a cherry on top, poor reviews of your business online from past employees. To avoid this negative outcome, utilize the tips listed in the next section. Ask employees for their feedback and input. Have an open-door policy. Employees want to feel that you are approachable. Balance the workload between employees to avoid burnout. Encourage employees to take time off. We all need a day or two to ourselves. Build a rapport with your employees to show that you are invested in them. For more employee engagement and employee motivation tips check out How To Empower Your Staff with Employee Engagement. 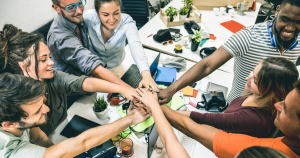 Now that you have these 4 employee retention strategies you need to implement, recruit the right talent for your business and keep them on board. The stronger the team, the better the success! As you build and keep your dream team you will need to have an IRS-authorized tax filing solution in place to stay tax compliant. TaxBandits can help you complete all the employment wage tax returns you need online with a simplified e-filing process. Whether it is 1099, W-2, 941 Form or more, we’ve got you covered! Create your free account today and let us help you save time and money.